Apparently, some people have taken my comments when Dixit won this year’s Spiel des Jahres award in a bad way, thinking that what I was saying was that the game did not deserve the Red Pawn. Nothing could be further from the truth. When I said that Dixit was not the kind of game that usually wins the Spiel des Jahres, my intention was never to talk bad about Dixit, my point was that of the previous winners, none was from the “communication game” family. Anyway, enough about history and my inability to do research and on to Dixit. Dixit is the game with the least complicated rules we have tried in a long time. One page is enough to explain the game, leaving the back of the page free for an example turn. Each player draws a hand of 6 cards, all of which have a unique image. One player is the storyteller for the round. He chooses one of his cards and comes up with a description for that card. This description can be as direct or indirect as the storyteller wants, the manual encourages you to use lines from poems or songs, movie or book titles, proverbs or even onomatopoeia. The other players hand over a card from their hand that also fits the description that was given. Those cards are shuffled with the original card from the storyteller and spread out on the table. The players – except the storyteller – now secretly pick the card they think is the storyteller’s. Dixit includes a set of voting chips for every player, so finally – FINALLY – you can secretly pick your favourite without that one guy that always hangs back half a second to see what everyone else is picking. Sometimes it’s so easy to improve on older game mechanics. 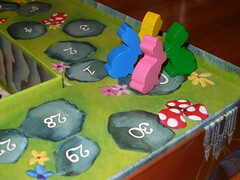 After all players picked a card, their choices are revealed and points are awarded by moving colourful wooden bunnymeeple around the scoring track. Yes, they are bunnies. No, there is no reason for it except that bunnies are cute. Sounds pretty boring from the description? Yeah, it would, if it wasn’t for one little twist in the scoring, a twist that may or may not be original to Dixit, but nevertheless a twist that really makes the game work: if all players or none of the players pick the right card, the storyteller gets no points. And suddenly, what I referred to as “describing” a card in the last paragraph becomes “subtly alluding to” a card. Saying “the one with the cat and the fish bowl” will not make you win, ever. And now it makes sense that the manual tells you to use poems, lyrics, titles, proverbs and so on. You are trying to find something, anything, that will make at least one other player guess your card while leaving at least one other player completely in the dark. Scoring is then a pretty easy affair: if all players or no player guessed the right card, all players except the storyteller gain two points. If only some players guessed right, they and the storyteller gain three points each. All players except the storyteller gain one additional point for every player that picked their card, so there is an incentive to contribute a card that matches the storytellers description. All players then draw a new card and the next player becomes the new storyteller. Keep playing until the pile of cards is exhausted. At this point, some people I was telling about Dixit lost interest in the game, saying that it sounded too much like a children’s game. It’s true that Dixit would play very well with children. The box states a minimum age of 8 years, but from my limited experience with kids I think that even younger ones would enjoy Dixit, although they may lack the ability to ambiguously describe their cards needed to win. The playability by children does not come as a surprise when you consider that the game designer, Jean-Louis Roubira, is a child therapist when not designing games. But just because it’s good for children it doesn’t have to be bad for adults, does it? After all, you still enjoy gummy bears and roller coasters, don’t you? In fact, in many ways Dixit feels like an exercise in taking you back to your childhood. It is designed to stimulate your creativity, to come up with wild associations to the pictures that you see. Abilities that children tend to have in abundance and many adults seem to miss. There is the little detail that the cards are bigger than the standard card size, so that holding six of them in your hands inevitably reminds you of holding your cards as a kid, playing with your parents. And of course, there is the artwork on the cards, looking like illustrations from your favourite children’s book. 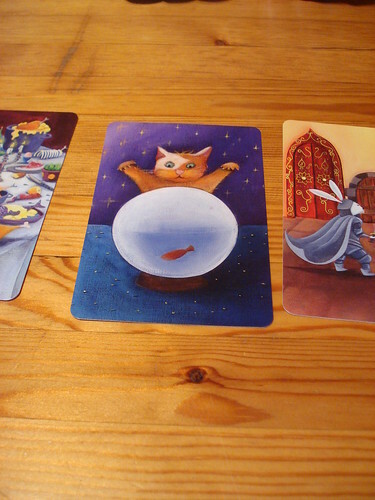 While Dixit is a good game already, it’s those illustrations that really make it. Artist Marie Cardouat has done a truly outstanding job with them. The cards are colourful and fanciful, ranging from happy through melancholic to slightly creepy, from almost everyday motifs through fairy tale imagery to surreal, and all done in a style that is likely to remind you of your favourite story book from when you were a kid. This artwork is what keeps the game interesting even after yo have seen all the cards once. It allows you to look at the card on many different levels, to come up with new associations each time you play and look at the same card with different eyes, so you never feel forced to pick a card from your hand just because everyone knows how you describe the others already. One more thing that bothers people when first hearing about Dixit is the lack of complexity. The rules are just too simple. While it’s true that the rules are not complex at all, the complexity of the game depends only on the people that you play with. Playing with a software developer, an architect come system administrator a couple of linguists a psychologist and a teacher, all of which are some combination of movie, music games and food geek and don’t lack creativity, I can’t complain that the game lacks complexity at all. It’s true that there is no strategy, but then Dixit doesn’t try to be a strategy game. And with all those people trying to obscure their cards just enough that not everyone guesses it, there is a lot of thinking around corners to make the game enjoyable. However, playing with people from different backgrounds like that does demonstrate a small weakness in the game: when you know the people you are playing with, it becomes relatively easy to come up with a description for a card that you know is obvious to exactly one person on the table, while all the rest don’t stand a chance. The same is true when playing with couples. For example: Sizinha, food and movie geek that she is, had been telling me about a movie calles “Babette’s Feast” the day before we played. When the card with the picture of a huge banquet came up, she could easily have said “Babette” or put up huge blinking signposts pointing to it to the same effect. No one else would have a chance. In the interest of fairness, she chose another description, but we had some similar situations arise during the game between different people. Now, I think it’s debatable if this way of playing is fair or not, but it is certainly not enjoyable for the players thus excluded. Still, if you’re playing to win it’s often your best strategy. Also, some players considered the balance between points awarded to the storyteller and points awarded to the other players to be a bit off. I don’t necessarily share that opinion, but the point balance does shift a bit with the number of players: with more players, there will be more points for having your cards chosen when you’re not the storyteller while the storyteller points stay the same. But with everyone taking their turn as storyteller, that is a very minor thing indeed. One more problem that we did encounter was a language barrier. While the whole game is language neutral – there is not a single word of text outside the manual and the manual comes in 8 languages, we had a bit of trouble playing in a mixed language group. Some of us feel insecure in German, while others are not completely fluent in English, and sometimes our finely crafted description of the card just fell flat because not everyone understood what we were alluding to. I’m guessing this is a problem that the majority of gaming groups out there will not experience much. The scoring and exclusion problems soon disappeared for us, when we decided to mostly ignore the point track and the end of game condition, reshuffle the stack and keep going. We were having a good time with friends, a bit of red wine and a lot of fun with the game, so who cares for points? If that, however, is not your general approach to playing games and the kick for you is to see your long term-strategy rewarded just before the game ends and grinding the metaphorical bones of your opponents into the metaphorical dust, you may find Dixit unrewarding. But please don’t take this as a recommendation to avoid it. You may find it unrewarding, but you also might find that you have an awful lot of fun just doing something very different from your usual game time. I was a bit sceptical at first, but after a few games Dixit really convinced me that it’s worth playing. So, do I think that Dixit deserved the Spiel des Jahres in the end? I still didn’t play any of the other nominees, so I can’t say for sure if it’s the best out of those five. What I can say is that it’s a very fun game, and certainly deserves to be on the list of winners. Congratulations Jean-Louis and Marie, you both did a great job.